The classic design and superb balance of the Gentlemen's Pen makes this pen a favorite among those who prefer larger, heftier desk pens. Available in three styles, the 10k and Titanium models feature black chrome accents on the center band and pen cap while the Platinum Series offers 22k gold/cobalt accents on a brilliant Rhodium finish. The fountain pen features a top quality German made two-tone nib with iridium point while the rollerball includes a ceramic tipped Schmidt ® cartridge for smooth, effortless writing. The "fast action" thread found on the Gentlemen's pen guarantees silky smooth operation and requires only 1 1/2 turns to attach or remove the pen cap. 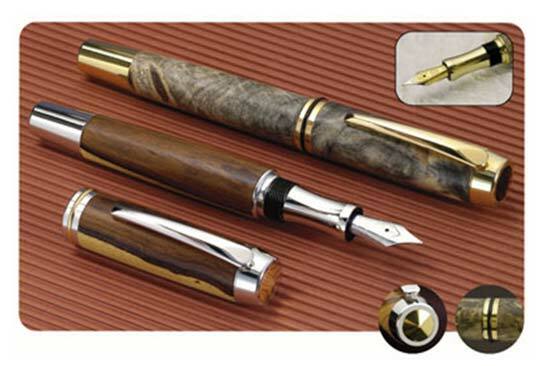 In the tradition of fine desk pens, the Gentlemen's Pen is not designed for use with the cap attached to the pen. This ensures that you will enjoy the effortless writing and superb balance of the Gentlemen's pen every time you use it. Just be sure to leave the pen cap in plain sight where others can see what they're missing!